OpenLM is a software license monitoring tool for a variety of concurrent license managers. It provides productivity tools for license usage optimization and application usage management. The EasyAdmin web application is meant for managers and system administrators. The OpenLM agent is meant for end-users. This document discusses the latter. The OpenLM Agent is a lightweight optional software component that is installed on end users’ workstations. It provides a set of capabilities that empower end users, making them less dependent on system administrators. The Agent does not present a risk of negative impact on the organization’s network; It limits end users’ capabilities to a subset of safe actions according to their specific area of work. End users are able to find out who’s got the license they need, and contact that person. Idle sessions are monitored, and presented graphically in OpenLM EasyAdmin. See here for more information: Monitoring Idle Application time. A notification for licenses being shut down is available by configuring the EasyAdmin Start → Administration → “Agent Policy” → ”Notification for recently closed applications” . OpenLM monitors a wide variety of licensed applications, and provides license usage statistics by directly querying specific types of license servers. OpenLM is constantly striving to enhance its capabilities, and add new license server types to its portfolio. Nevertheless, there will always be license server types for which OpenLM will not have a dedicated interface to apply license usage queries. It is for such cases that OpenLM has developed a unique solution; The OpenLM Agent is employed to accumulate usage statistics on the end-users’ workstations. OpenLM refers to this capability as “Unmanaged licenses” monitoring. Further details on this can be found here: Working with Unmanaged licenses. The OpenLM Proactive License Manager serves as a shell for vendors’ license managers. It provides intricate license management capabilities that are not provided by the vendors’ license manager. It is designed with the users’ best interest in mind, and with the intention of returning control back to the software users. The OpenLM Proactive License Manager interfaces the the end-users workstations through the OpenLM Agents, and may be configured to intercept the launching of applications according to predefined configuration. After the license pool has been exhausted and end users are denied from checking out further licenses, they would receive license availability notifications when these licenses have been made available again (see below). This option is enabled by checking the EasyAdmin Start → Administration → Agent Policy”Available license notification” box. OpenLM can be configured to log license usage according to projects. The OpenLM Agent may prompt the end user for the currently active project name to actively select the project name through a menu item. This will attribute all license usage on that workstation to the selected project, until the setting is changed. OpenLM was originally written by ESRI ArcGIS veterans, and as such still includes some ArcGIS specific benefits. Setting the ArcGIS license level is one of them. Additional information such as the Workstation IP is provided to the OpenLM Server by the Agent. 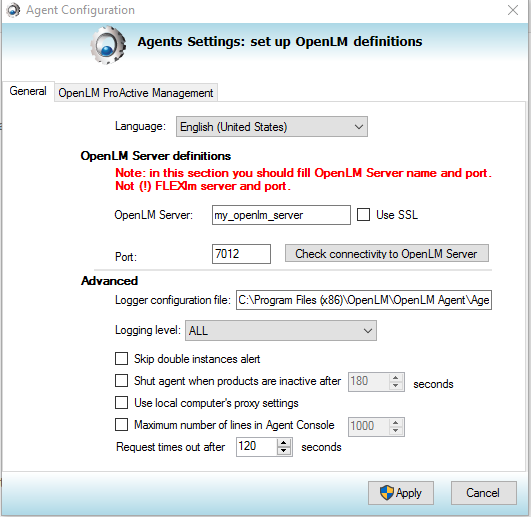 The OpenLM Agent is available in the Downloads section on the OpenLM site. OpenLM Agent can either be installed manually per workstation, or silently distributed by a script: OpenLM Agent Silent Installation. During installation, the user may be prompted to choose whether to add OpenLM extensions to certain supported applications. At the time of writing this revision – these applications include ArcGIS, Autodesk and MATLAB. 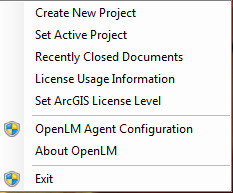 The OpenLM extensions provide additional capabilities for such as saving and closing idle sessions and managing ArcGIS license levels (see below). As stated above, OpenLM can attribute license usage according to active projects. The end user may create an active project name or be prompted to select the active project from a dropdown list. In addition, applications can be automatically shut down at a predefined time by checking the EasyAdmin Start → Administration → “Active Agent” → ”Extension dedicated” → ”Actively shut open applications down at” box. OpenLM will indicate such cases of administrative license closure in the “Recently closed documents” window. Clicking the magnifying glass will pop a screenshot of the application prior to its closure. Clicking the Process name will resume the application, and check out a new license for it (if available). The ability to query license availability from the end user workstation is a very important step towards improving license usability. The license usage window displays the total number of used, borrowed, and available licenses per license server. Click on a row to get the complete list of active users who are currently drawing on a specific license (e.g. : ArcView). Click on one of the user entries (e.g. : CPearson), and you will get the user’s details as are available on the OpenLM database. The license usage status may be hidden from end users by checking the ”Hide license status query option” box, follow this path: EasyAdmin Start → Administration → Agent Policy. There are several methods of filtering entries in the Agent’s license usage window, so that end users would only see the information regarding licenses of interest. 2. By applying roles and permissions to users and user groups. This will limit the presented information to specific license servers. Start → All Programs → OpenLM → Agent → Tools → OpenLM Agent logs folder. 3.3 Check the ‘Hide’ button for each entry that the user will not see. This will invoke appropriate entries in the OpenLM_Agent.config XML file. 3.4 This file can be now distributed among users, to show only the features of interest. Three licensing levels are available in ArcGIS (From high to low): Professional, Editor and ArcView. ArcGIS end users can set this licensing level before activating the software. If such a license is available, the software will start in that chosen level. The option of shutting down the agent software on the local workstation is hidden by default and can be displayed by clearing the ”Hide exit option for local administrator” box. Follow this path: EasyAdmin Start → Administration → Agent Policy. NOTE: When the agent is closed, the OpenLM system is unable to ascertain license activity on that computer, therefore idle license retrieval will not be performed. At most cases, the OpenLM Agent would be silently distributed among all workstations of a network. The OpenLM Agent Configuration form is designed to manually set and test the connection of a single workstation to the OpenLM server. “Language” : Click the drop-down menu and select from the list of languages to be displayed in the Agent windows. “OpenLM Server” : This is the OpenLM server, NOT the license (e.g. : Flexera FLEXnet) server. “Use SSL” : use this option to use secure communication between the OpenLM Agent and the OpenLM Server. This process requires acquiring an SSL certificate, and should be performed by a system administrator. For more information – please consult this document. 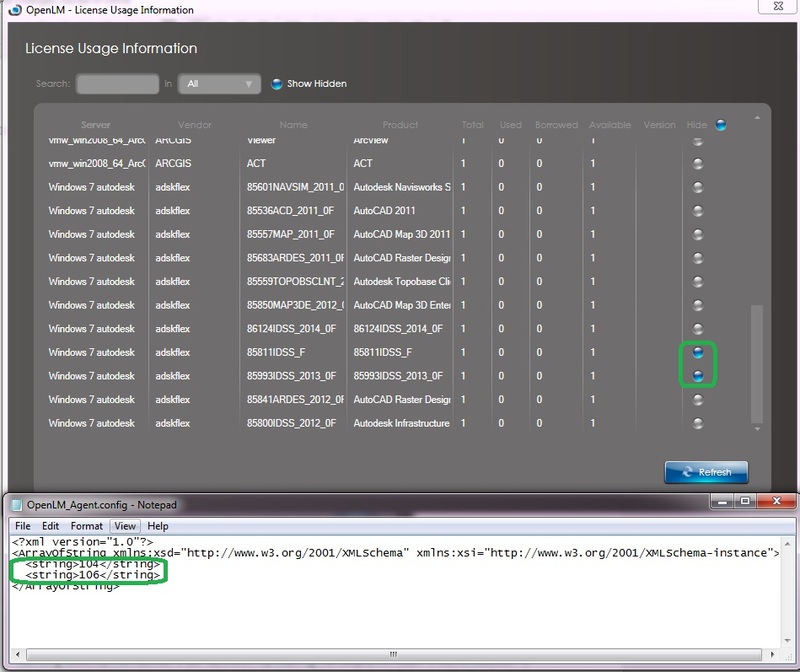 “Logger configuration file” and “Logging level” The Agent’s Log file location and logging level are set here. “Skip double instance alert” (Disabled by default): Avoid being notified when trying to open a 2nd Agent instance. “Shut Agent when products are inactive after … seconds:” This is option is meant for virtual workstations like Citrix. Shutting down the Agent when there are no active applications will enable the Citrix workstation to shut down, avoiding unnecessary Citrix license consumption. “Use local computer’s proxy settings” (Disabled by default) : Communicate with the OpenLM server via proxy. “Maximum number of lines in the Agent Console”: The Agent Console is a useful debugging tool that accounts the status of the OpenLM Agent. In order to open it, follow this path: Windows’ Start → All programs → OpenLM → Agent → Tools → OpenLM Agent Console. These capabilities and configurations are elaborated in the “OpenLM Proactive Application Manager – AN4058” document. 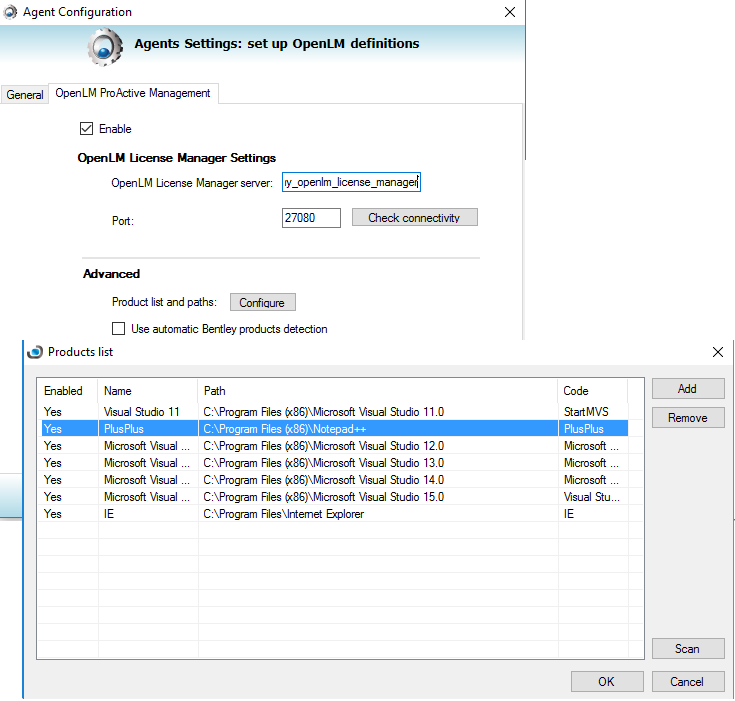 There are two configuration windows for the OpenLM Agent in the EasyAdmin administrative web application. 1. The ”Active Agent” window is accessible by following this path: EasyAdmin Start → Administration → Active Agent. This window is dedicated to the functionality of idle license retrieval, and is fully elaborated in the respective Application notes (see above). 2. The ”Agent Policy” window is accessible by following this path: EasyAdmin Start → Administration → Agent Policy. All the configurations in this window have already been explained above in this document.